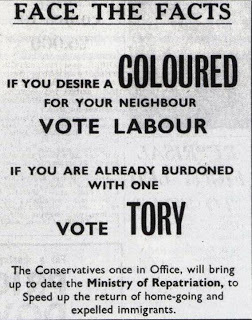 Conservative Party election poster, 1964. Conservative Party van to drive through housing estates, 2013. 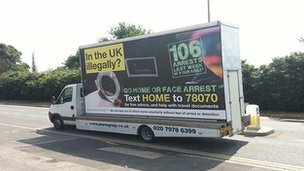 This van will drive around Barnet, Hounslow, Barking and Dagenham, Ealing, Brent and Redbridge, all in the Greater London area, displaying a number that immigrants can text to arrange a safe passage “home”, despite the fact that the UK may have been their home for decades. The Conservative Party of Great Britain and Northern Ireland is a parody of itself.